HOME Africa Zimbabwe “My daughter is still a virgin,” says Mugabe’s wife. BONA Mugabe probably suffered one of those full-body cringe moments of mortification Saturday as her mother publicly boasted that she was still a virgin and would remain chaste until her wedding day because that is what she, the First Lady, wanted. 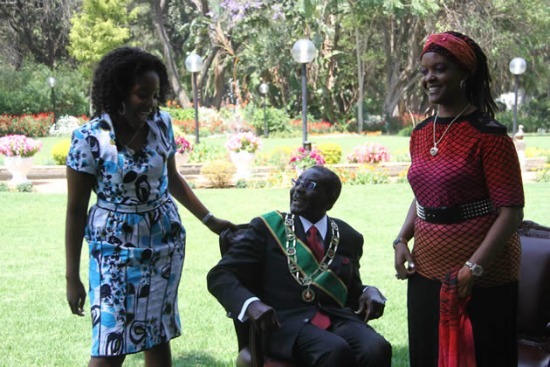 President Robert Mugabe’s 24-year-old daughter completed traditional marriage formalities with boyfriend, Simba Chikore, at the family’s Zvimba rural home in August with the Qatar Airways pilot said to have paid US$35,000 in bride price. Speaking openly about her daughter’s marriage at a women’s conference in Harare, the First Lady said plans for what could be Zimbabwe’s version of a royal wedding were at an advanced stage adding, helpfully, that the union would not be consummated until then. A gushing Grace told the gathering that once she became aware of their relationship she immediately told her prospective son-in-law that she wanted her daughter to be married a virgin. The First Lady dismissed as lies online reports in 2010 alleging Bona had been raped in Singapore after a student party. “There were reports that my daughter was raped … nothing of that sort ever happened. She is a virgin,” she said. And adressing her daughter who was in the crowd directly the First Lady added: “You make me proud and I am a proud mother. “We all know that it is difficult to raise daughters especially if you are coming from the kind of family she is coming from where in some instances parents have a tendency of over spoiling children, whatever they ask for they are given without questioning. President Mugabe has also talked effusively about his daughter, describing her as “very obedient” and “absolutely trustworthy” in an SABC interview in May. Bona graduated with a Bachelor of Business Administration (Honours) in Accountancy degree from the University of Chan Tai Ho Hall in Hong Kong in 2011. She has also since attained another degree in banking and finance from Singapore and is set to graduate again in November next year.